Members of a House subcommittee joined with citizens, policymakers, and researchers at the Virginia Institute of Marine Science on September 21 as part of their on-going efforts to develop a comprehensive and coordinated plan for addressing coastal flooding and sea-level rise in the Commonwealth. The meeting was scheduled long before the current bout of flooding throughout Tidewater Virginia, but the issues discussed closely parallel the challenges faced during the last week by localities from Mathews to Virginia Beach and beyond. Joining committee chair Chris Stolle (R-83rd) for the afternoon session were senators Lynwood Lewis (D-6th) and Mamie Locke (D-2nd); delegates Rob Bloxom, Jr. (R-100th) and Keith Hodges (R-98th); and citizen members Richard "Tuck" Bowie, Nikki Rovenor, and James Woods. The resulting VIMS report, Recurrent Flooding Study for Tidewater Virginia, found that recurrent flooding already impacts all localities in Virginia's coastal zone and is predicted to worsen over reasonable planning horizons of 20 to 50 years due to sea-level rise, land subsidence, and other factors. Based on these findings, the subcommittee was asked to formulate short-term and long-term strategies to address recurrent flooding in the Commonwealth, with an executive summary of its findings due to the General Assembly no later than the first day of its 2016 regular session. Dean and Director John Wells welcomed the subcommittee and audience to VIMS’ Gloucester Point campus, saying, “We are delighted to host this group, especially since they are doing such valuable work. Coastal flooding is one of the most important issues facing the Commonwealth today and in the coming decades.” Wells is a member of Governor Terry McAuliffe’s Climate Change and Resiliency Update Commission, which itself is tasked with providing recommendations to help the Commonwealth adapt to coastal inundation. Addressing the subcommittee were individuals from city, state, and federal agencies involved in research and policymaking related to coastal-flooding risks, vulnerabilities, and adaptation. The initial speaker was Molly Mitchell of VIMS’ Center for Coastal Resources Management. 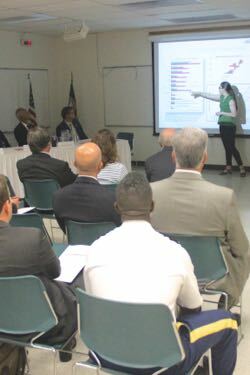 One focus area has been an effort to develop interactive web-based “portals” for localities throughout coastal Virginia. “The portals are gateways to resources at the local level,” says Mitchell. “Each one allows users to view the effects of sea-level rise in their communities, assess best management practices for their shorelines, and identify gaps where more data is needed.” Creation of such portals is one of the recommendations Virginia’s Climate Change Commission plans to forward to the Governor early next year. Another focus area is work to map social vulnerability—a measure that compares data on physical factors such as height above sea level with socioeconomic indicators such as income, car ownership, and levels of physical disability to identify areas where citizens are most at risk to flooding. CCRM has collaborated on this project with the Southeast CARE Coalition, a community-based partnership in Newport News. The CARE program director is VIMS alumna Dr. Erica Holloman. Other speakers— Colonel Jason Kelly, Norfolk District Commander of the U.S. Army Corps of Engineers; Whitney Katchmark of the Hampton Roads Planning District Commission; Lewie Lawrence of the Middle Peninsula Planning District Commission; and Dr. Katerina Oskarsson of the Norfolk City Manager's Office—discussed how their respective agencies and jurisdictions are moving forward with plans and projects to increase the resilience of Virginia’s low-lying coastal communities. Colonel Kelly, a recently appointment, stressed his agency’s continued focus on coastal flooding during the administrative transition. Katchmark and Lawrence described progress and challenges in their respective jurisdictions, with Lawrence focusing on needed improvements in Mathews County’s system of roadside drainage ditches. Oskarsson updated committee members on the status of Virginia’s proposal to the U.S. Department of Housing and Urban Development’s National Disaster Resilience Competition. If successful, the grant would provide $1 billion for projects to re-invent Hampton Roads as a national model for living with rising seas. The forum at VIMS was the House subcommittee’s third meeting of 2015. A fourth meeting is scheduled for later this year.